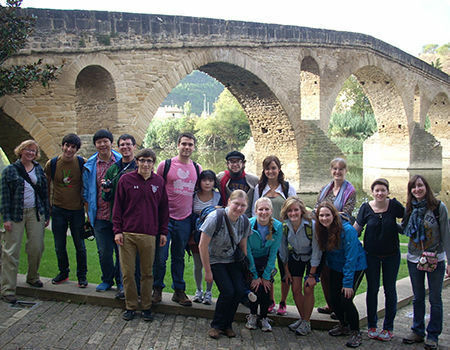 Fifteen Notre Dame students, along with two of their professors from the College of Arts and Letters, traveled to northern Spain over fall break to experience the Camino de Santiago—one of the most important Christian pilgrimages during medieval times. History Professor Olivia Remie Constable, the director of the University’s Medieval Institute, and Danielle Joyner, an assistant professor of medieval art history, say it was an academic adventure they won’t soon forget. And their students agree. “This is hands-on experience, constant discussion, going out into these churches, interpreting for yourself, and applying what you know about a structure to really bring everything together,” says Mairead Mumford, a senior majoring in medieval studies and Irish language and literature. 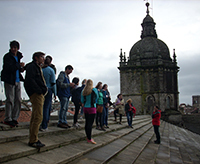 The trip, supported by a Teaching Beyond the Classroom grant from the College of Arts and Letters, was part of an interdisciplinary medieval studies course called The Art and History of the Road to Santiago de Compostela. 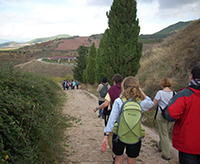 Junior studio art major Liam Cawley says the opportunity to actually travel along the pilgrimage route was intense but rewarding. Before the trip, students prepared reports focused on specific sites along the route. Listening to the presentations while at each of the locations made the research come alive for the entire class, and was one of the highlights of the trip, Constable says. “So many of the things that we’ve studied suddenly make sense, now that we’ve seen them,” she says. While much of the trip was beautiful, Mumford says, some of the most powerful moments came when they glimpsed the realities facing pilgrims traveling the same path in the Middle Ages. Whether walking into an unlit Romanesque church that was “overpoweringly gloomy,” or standing in cold, wet weather at the banks of a creek medieval travelers once forded, “you could really put yourself in a pilgrim’s shoes,” she says. In creating the course, Joyner and Constable sought to help students develop the types of insights that only an interdisciplinary approach can bring about. Through an application process, the professors chose students from a range of majors including history, theology, art history, engineering, and studio art. “We wanted to make sure we got a real mix of people and interests,” Constable says. Cawley, for instance, is doing a series of six paintings illustrating one of the stories from the Cantigas de Santa Maria, a medieval Spanish codex telling the story of the miracles of Mary. “One thing that I’ve been considering with my project is the way that religion and religious art fits into contemporary art,” he says. 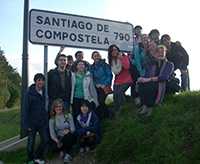 Both professors said taking the trip created a sense of community among the students. After traveling together for a week, the class became much closer. For Joyner, one moment specifically summed up the impact the class had on all of them. 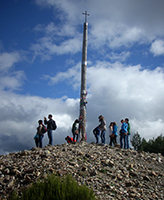 After entering one of the churches along the Camino de Santiago, a student felt moved by the structure and its history, she recalls. Originally published by Jonathan Warren at al.nd.edu on December 16, 2013.